Continuing with themed puzzles, this week the horse lovers get a treat with Galop, a packing puzzle from the family of Picture Frame Puzzles, designed by Jean Claude Constantin from Germany. What seems like a simple puzzle at first sight, is actually a very difficult challenge, trying to pack all five pieces in the frame. 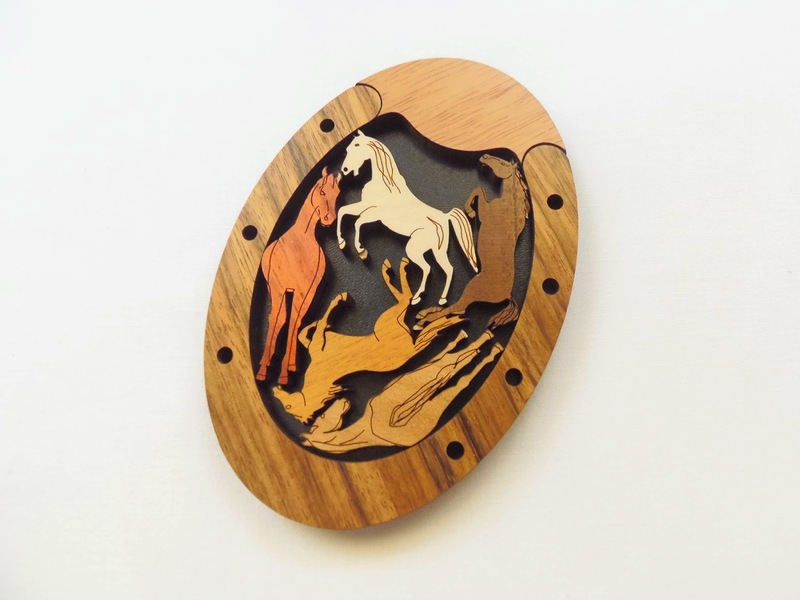 The puzzle is beautifully made with different shades of laser-cut wood (plywood), each piece designed with great detail, and complemented with a horseshoe-shaped tray. 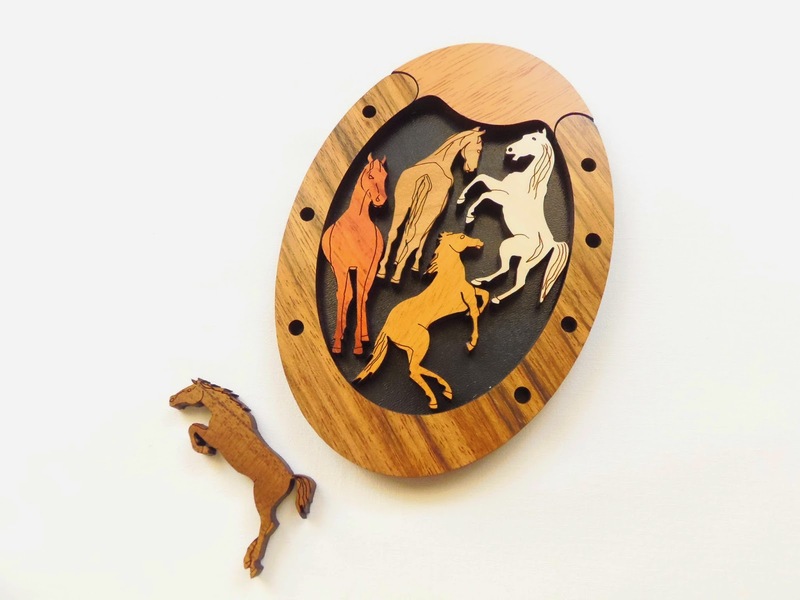 The horses are cut in different poses, adding extra complexity to an already difficult puzzle. It comes unsolved and without a solution, so you're on your own to try and find out how to neatly pack all the pieces in the frame. 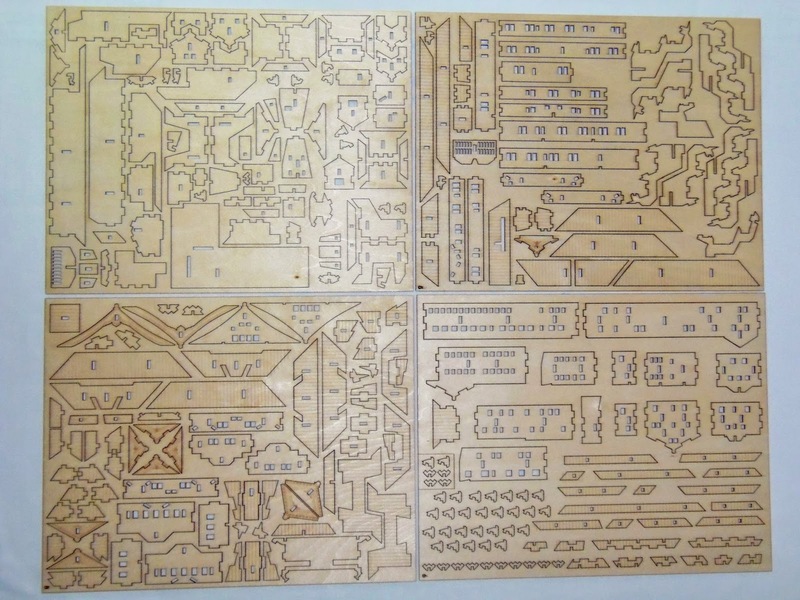 The puzzle is a bit small, measuring 12.2cm x 8.4cm (4.8" x 3.3"). I love Picture Frame Puzzles but they're usually quite challenging. What I find fascinating about this type of puzzles is how you need to study each piece, its curves and indentations, and trying to figure out how they can interact with other pieces in order to save the most space in the frame. It's a very immersive process, which few other puzzles are able to offer. The difficulty of the puzzle is rated as a level 8/10, but this is very subjective. I agree with the difficulty, but it can be even harder if you've never solved one of these. It took me about 20 minutes to find a solution, and even so I'm not sure if it's the ideal solution, as the pieces seem too tight. One thing to be aware of is that you can only use the top side of the pieces - no flipping allowed - because the engraved marks are on one side only. Also be careful not to chip the pieces, since many of the edges are very small and fragile (e.g. the horses' hooves and ears). This happened to me on a couple of pieces, unfortunately. Galop is a nice little puzzle, a bit challenging for a beginner, but its cute design will surely captivate the attention of any horse lover. If anything, it's a Constantin puzzle, which in itself is a guarantee of quality. 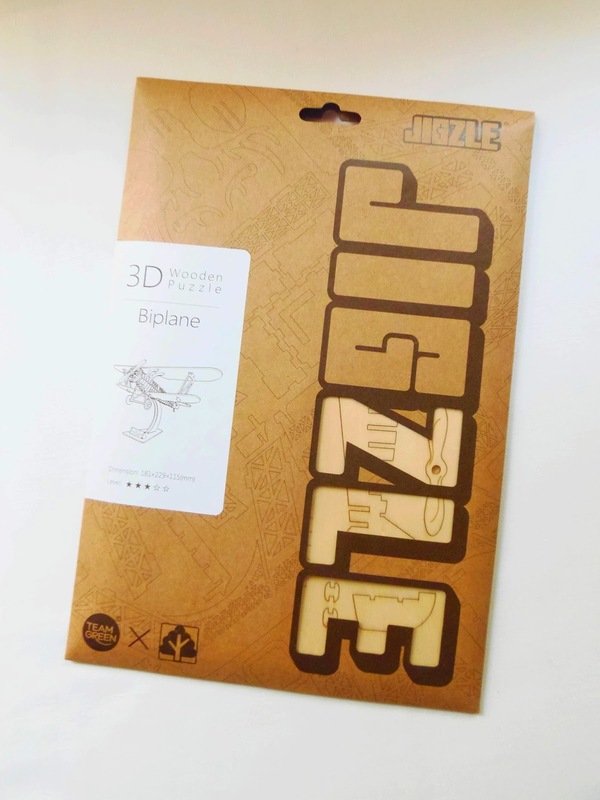 Availability: Galop is available at PuzzleMaster for $19 CAD. There's a wide selection of Constantin's puzzles, all great choices. If you're "fauler" you'll have a hard time solving this puzzle by Jean Claude Constantin. 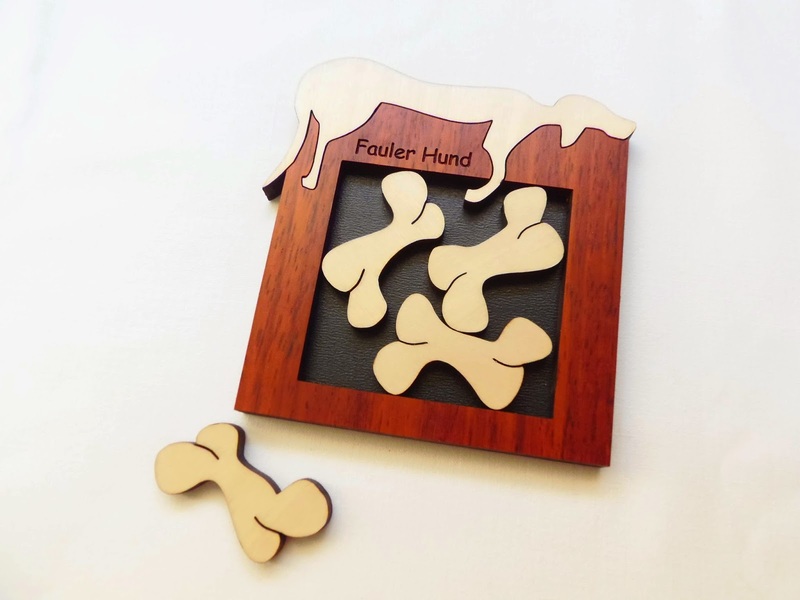 Fauler Hund (German for "lazy dog") is the perfect puzzle for all you canine lovers out there, but I'm sure it will also delight any packing puzzle aficionado. 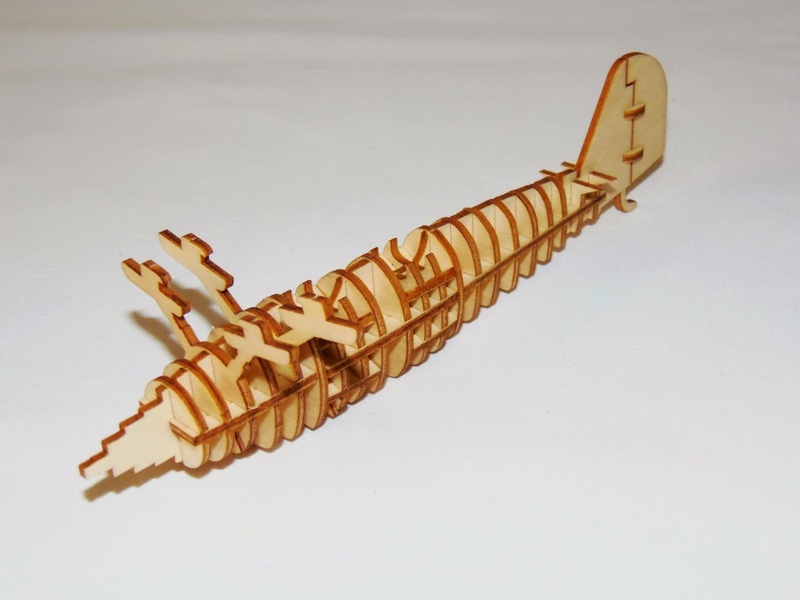 Made with two contrasting wood tones, the pieces and the frame were laser-cut with plywood, a low quality type of wood, but necessary to achieve the precision seen in its design, since it's a softer material to work with laser-cutting machines. Design-wise, the puzzle looks great. The shape of a dachshund is seen at the top edge of the frame, and the pieces, at first looking identical, are actually distinct from each other, having slightly different shapes. When solved, all the four bone-shaped pieces lie tightly in the frame without much wiggle room, even though there's a lot of empty space left. I found the solution is very similar to the classic The Four T puzzle. The shape of the pieces in the two puzzles, despite appearing very different, are actually pretty similar when you analyse both puzzles. With this in mind, I didn't have much difficulty finding the right solution. On The Four T puzzle all the pieces are identical and therefore only one solution is possible. However, since the Fauler Hund puzzle has different pieces, it's possible to pack the pieces in a different order or orientation, but always in the same kind of arrangement, just rearranging and swapping some pieces. Only one side of the pieces shall be used, since the backside has the cut lines less pronounced. Being a packing puzzle fan, it's always a pleasure to solve any of these puzzles, even more by being a design made by Constantin. It's a shame about the resemblance to The Four T puzzle, since I didn't find it as challenging as I would've liked. 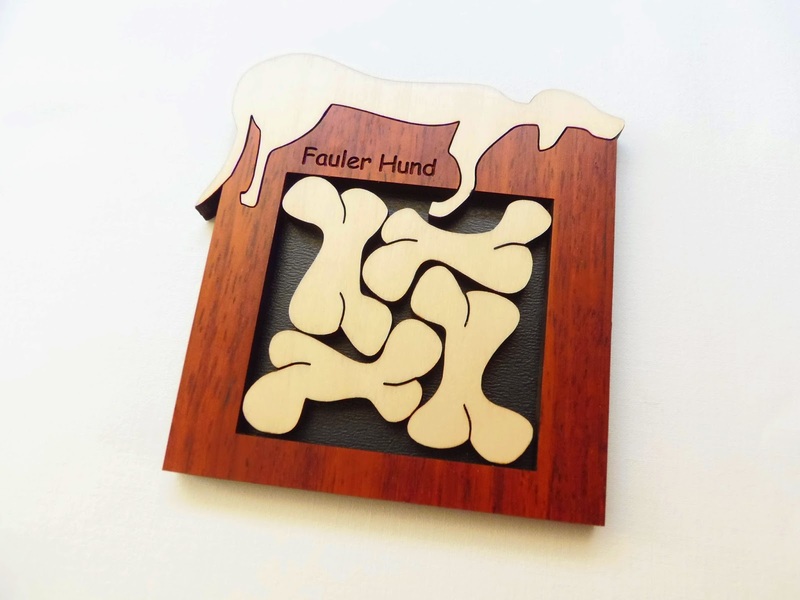 Availability: Fauler Hund is available at PuzzleMaster for about $19 CAD. There's also many other interesting puzzle by Constantin there. Siebenstein-Spiele doesn't make many interlocking puzzles - most of their catalog is packing puzzles or slide puzzles - but the ones they do make, end up being quite impressive designs. Nur Mut (a German term meaning "Be brave!" or "Have courage!") 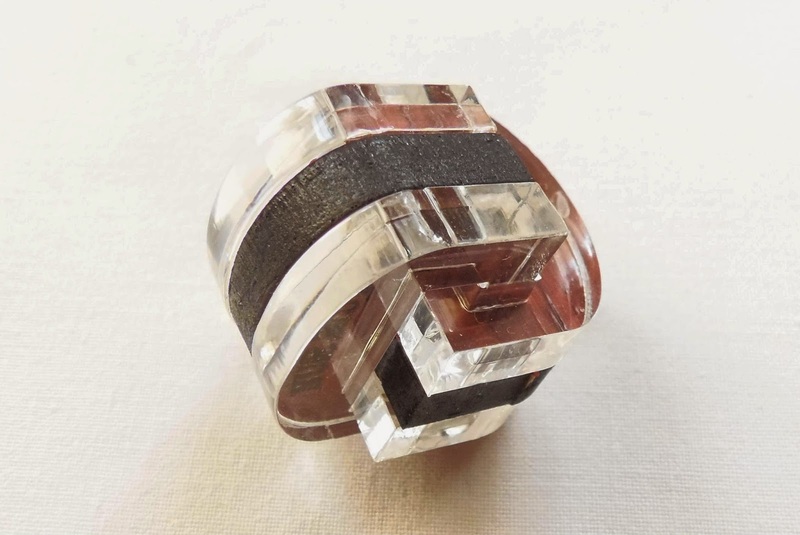 is a tough interlocking puzzle, designed by Jürgen Reiche, that will surely get you some frustrating moments. I was very surprised by the size of the puzzle, which is not noticeable from the photos. This is actually one of the tiniest puzzles on my collection right now, measuring only 3cm in diameter (about 1.18"). It looks like a sample of another puzzle, but it's quite functional and surprisingly well made, considering the small size of its pieces. Nur Mut consists of six interlocking pieces. There are only three distinct pieces: one group has three congruent pieces; the other group has two; and there's one single unique piece. 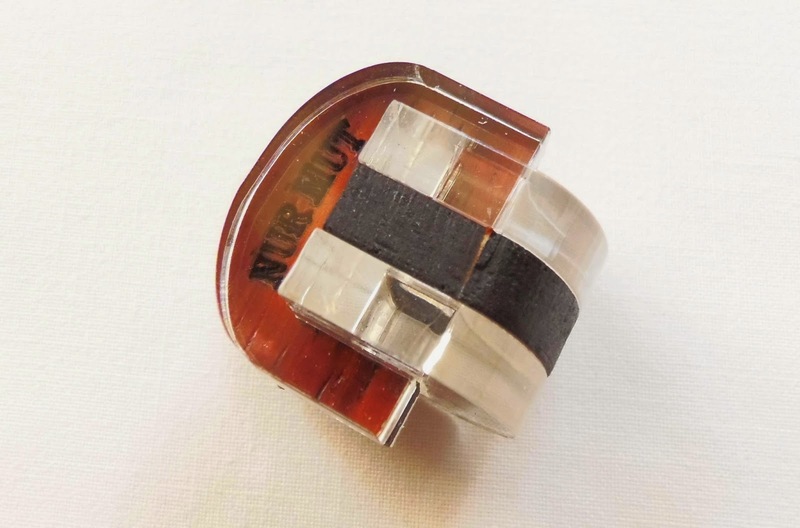 The design is charming, with four acrylic pieces and two wooden, both in the middle of each layer. 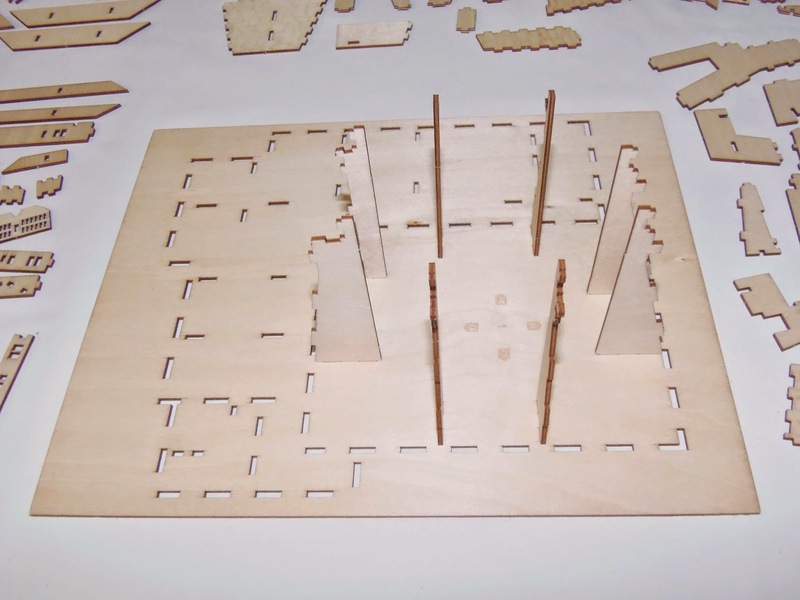 The pieces are laser-cut with precision, otherwise the puzzle wouldn't work so well at this size. As expected from interlocking puzzles, taking it apart is not so difficult. I was able to solve it within a couple of minutes. The real challenge in these cases is returning it to its original shape, which is something that I always dread. From the photos, it's easy to see how the puzzle should look like when solved, but the correct sequence of moves is extremely difficult to figure out. I've tried to solve it with the help of the solution, downloaded from PuzzleMaster, but I found it very confusing. It's not a step by step guide, only a brief description of the solving process. It's also unclear whether the solution shown is to take it apart or to reassemble it. As of now, the puzzle is yet to be completely solved. Nur Mut is a must-have for interlocking puzzle fans, but it's not recommended for beginners, or it will be a very frustrating puzzle. The design is what captivated my interest at first, and I'm glad to add another Siebenstein puzzle to my collection. And this one doesn't take much space, something very welcoming right now. Availability: Nur Mut is available at PuzzleMaster for $12.99 CAD. Other puzzles by Siebenstein-Spiele are also available. Team Green is a Hong Kong based company that produces environmentally friendly and safe products. 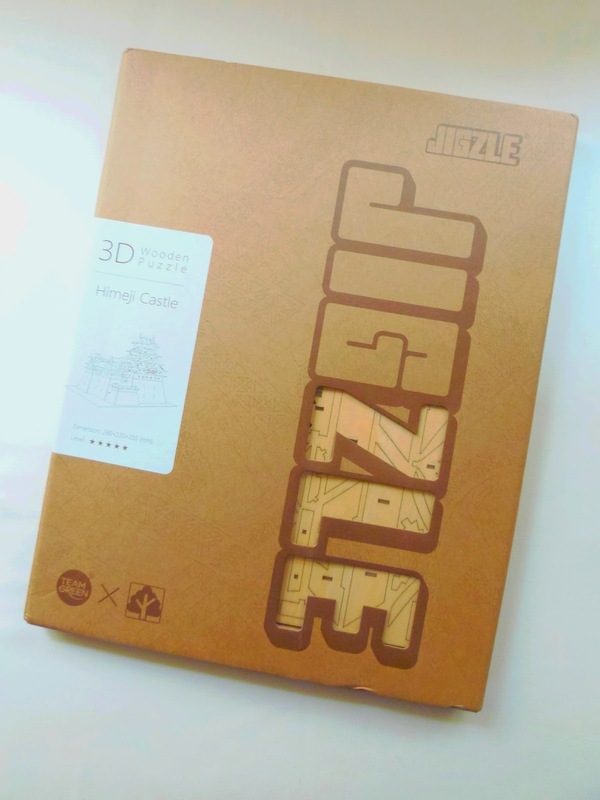 They have an impressive range of puzzles called Jigzle, made with plywood (thick paper models are also available), which will sure bring back memories from when you were younger and building those 3D plastic models. 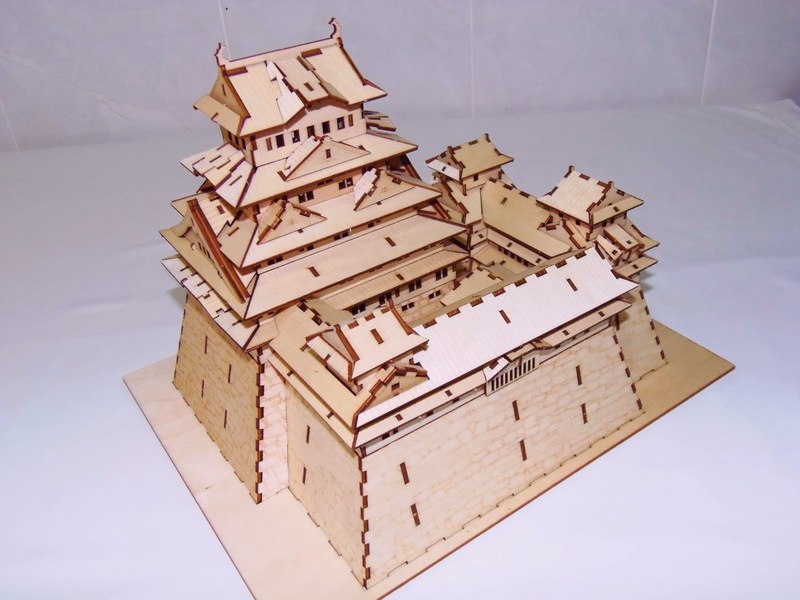 I will be reviewing two of the company's wooden models, a Biplane and the Himeji Castle, both quite complex models with lots of pieces, especially the castle. 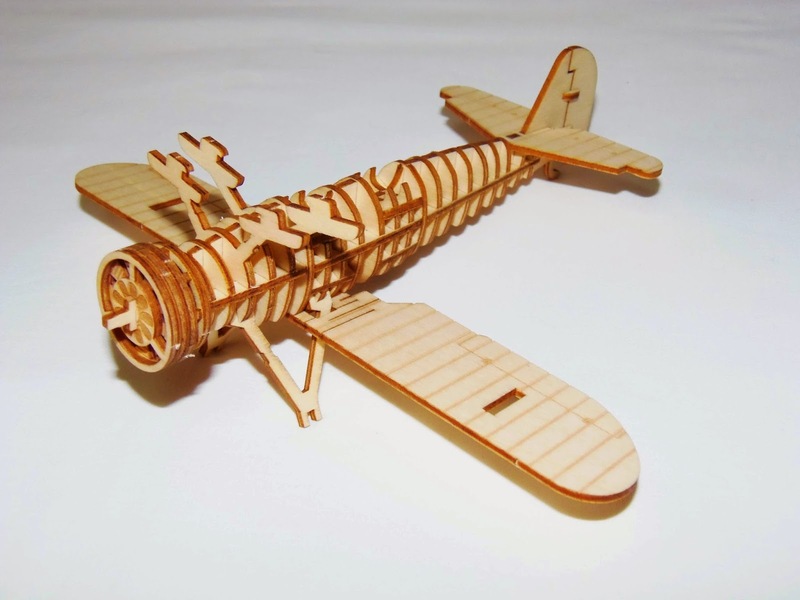 I'll start by describing the Biplane, then continuing with the Himeji Castle. 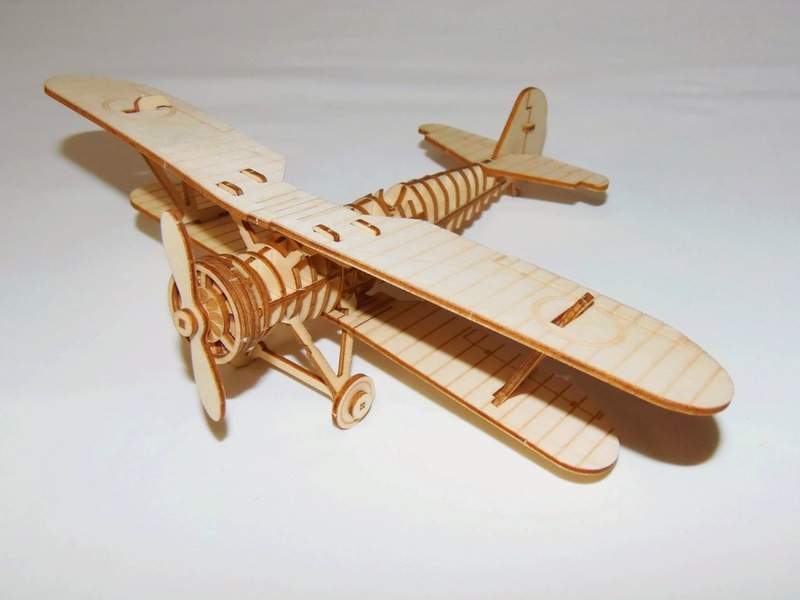 The Biplane comes in a recyclable paper envelope - another proof of how environmental conscious the company is - and inside you'll find three wooden panels with all the pieces neatly arranged and pre-cut for your convenience. 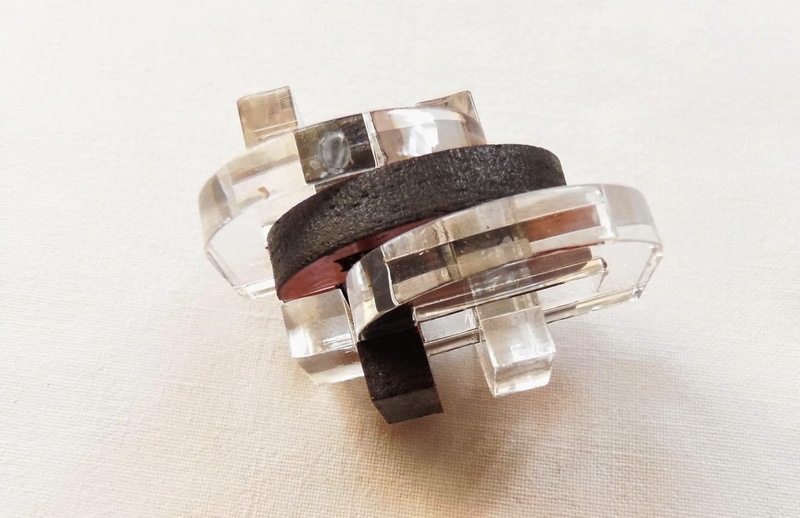 This process requires a somewhat careful approach, as many of the pieces are small and fragile, and you may end up breaking them if you don't push them out gently. Thinking of that possibility, the manufacturer made sure to include a few spare parts, the ones that are most likely to break in the assembly process. There are a total of 50 different pieces (not counting identical pairs), and assembling them took me approximately one hour. The instructions are very easy to follow, with detailed depictions of every major step in the assembly process. Each piece has a different number assigned to it, which makes your task quite pleasurable and enjoyable - like painting by numbers. The difficulty level is 3/5. 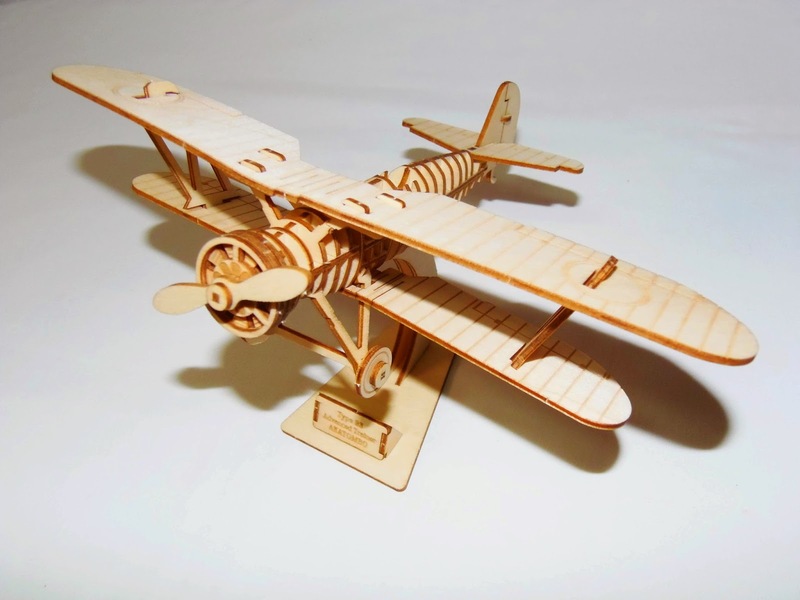 After you have finished your model, it makes for a great decorative object in a shelf or a desk. 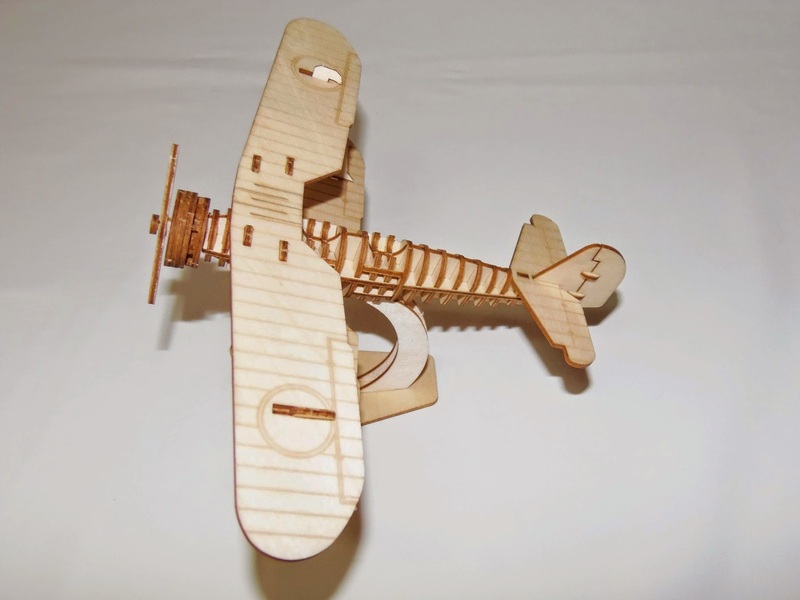 The propeller in the Biplane actually works if you spin it. The finished model measures about 18.1cm x 22.9cm x 11.5cm (7.12" x 9" x 4.52"). 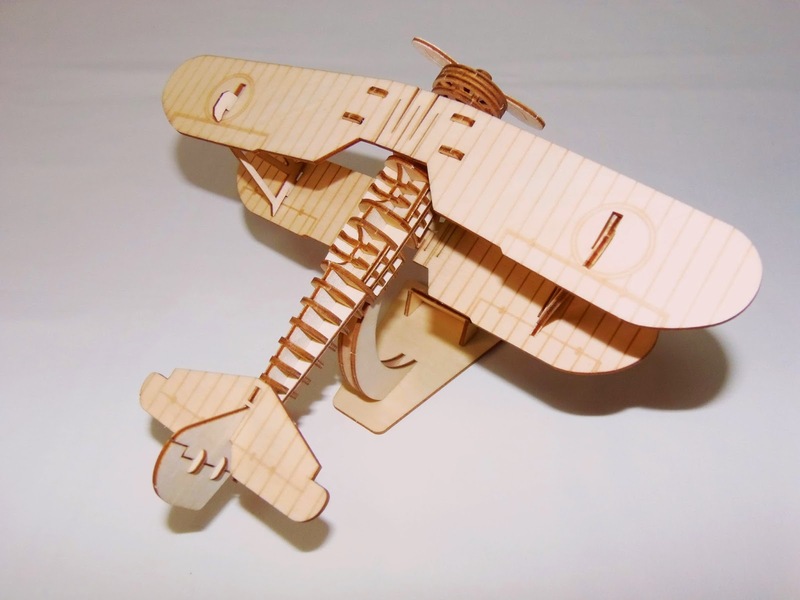 Compared to the Himeji Castle assembly, the Biplane was a walk in the park. 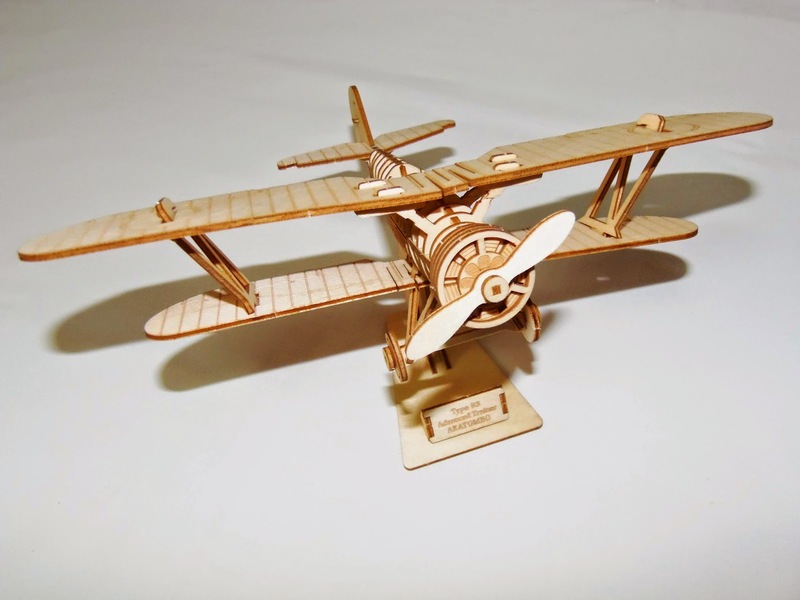 If you thought building a biplane would be tricky, wait until you build something this large with a whopping 240 different pieces (including identical series of pieces, the number ascends to 300+), which took me about 6/7 hours to build, in three different sessions. 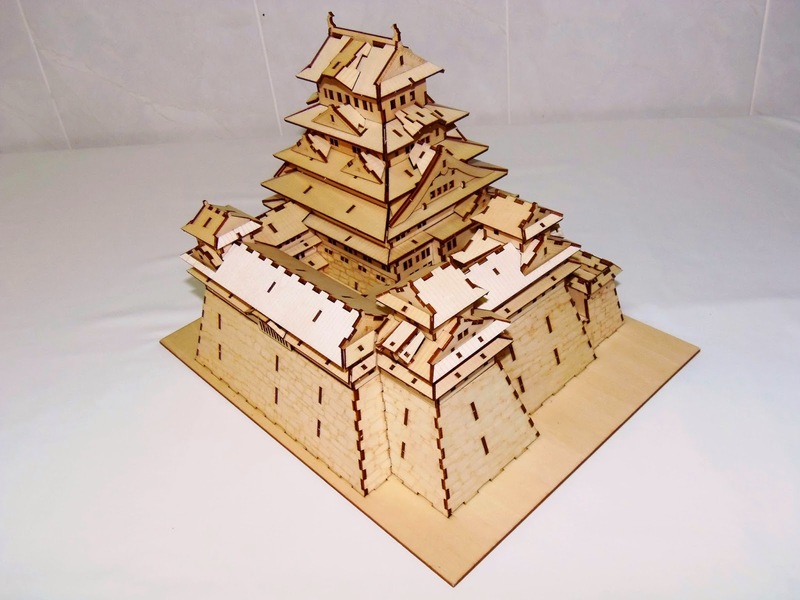 The difficulty level for the castle is 5/5, the highest in the manufacturer scale. 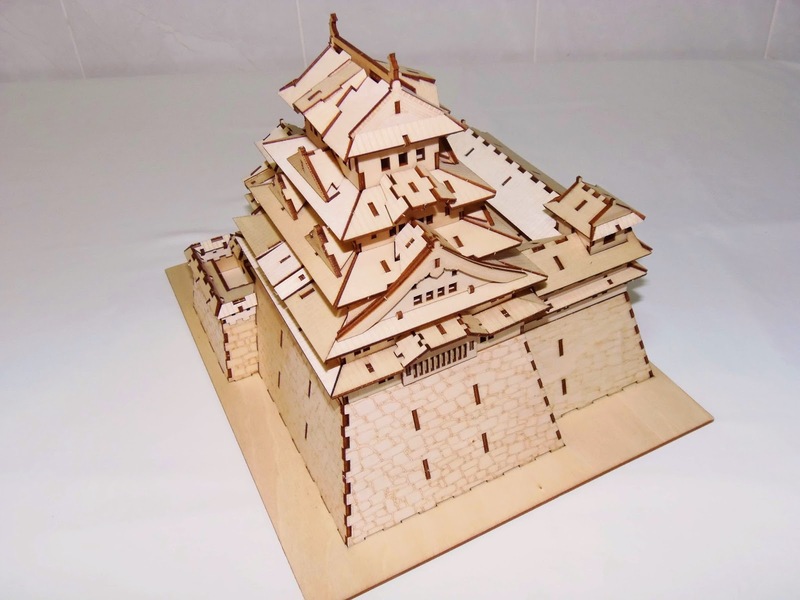 You might be wondering, how accurate is the model of the Himeji Castle when compared with the real thing. 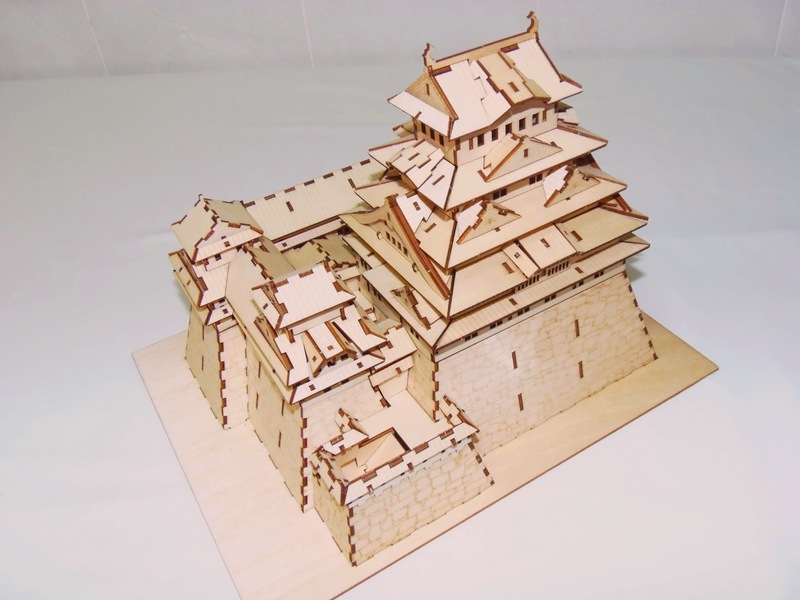 Well, I've never visited Japan, so I can't say with 100% certainty, but from what I gathered from several photos of the castle, I found it's actually pretty close in configuration from the real castle, considering it's just a wooden model. 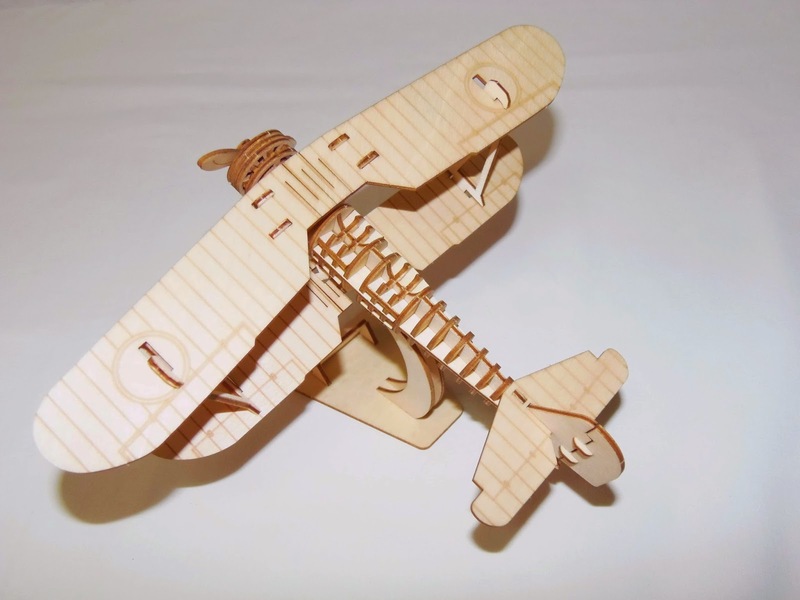 The pieces come packaged in a sliding paper folder, the same material as the Biplane's package, and inside, the pre-cut pieces are presented in eight panels. Actually, the first panel doesn't have any pre-cut pieces to push out. This one will be used as the base for your castle. 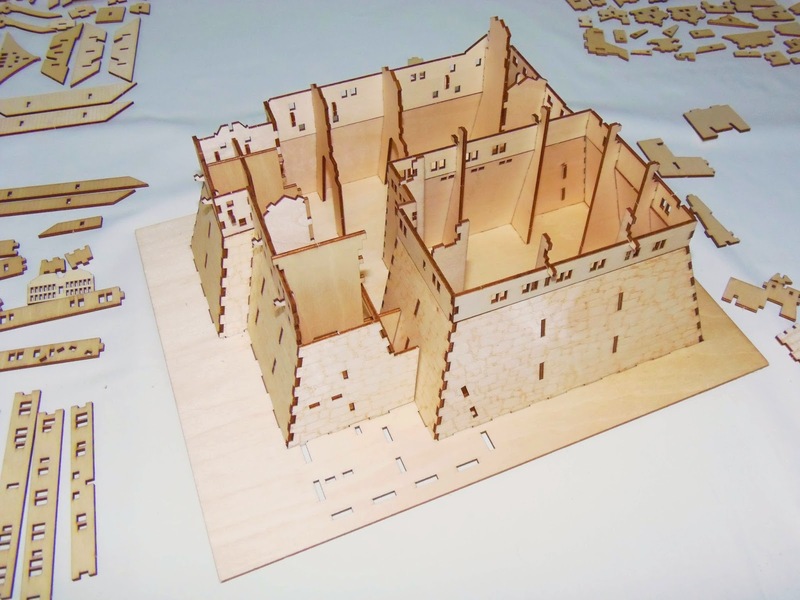 When complete, the castle will measure 28cm x 22cm x 21cm (11" x 8.66" x 8.27"). With a project this size, it's understandable that you feel a bit overwhelmed at first. 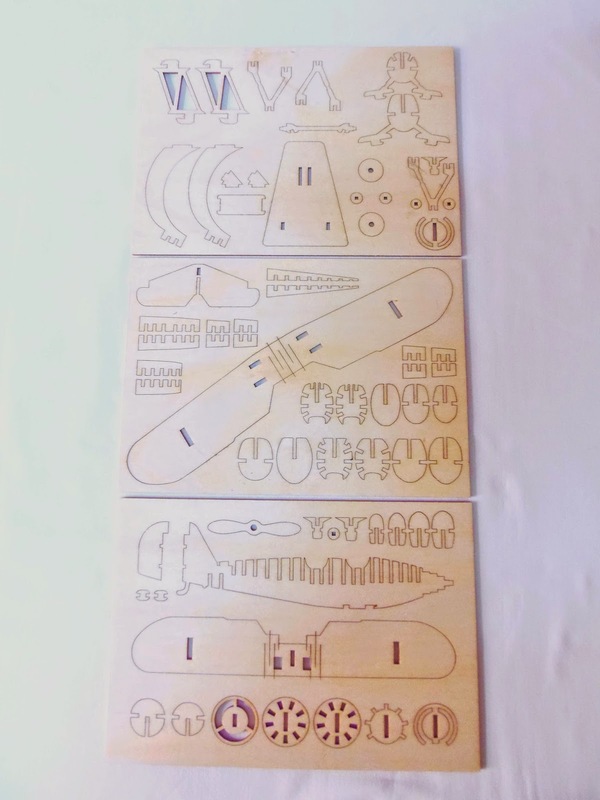 However, like the Biplane, the instructions are very well made and will make you feel confident as you progress further into the assembling of the castle. 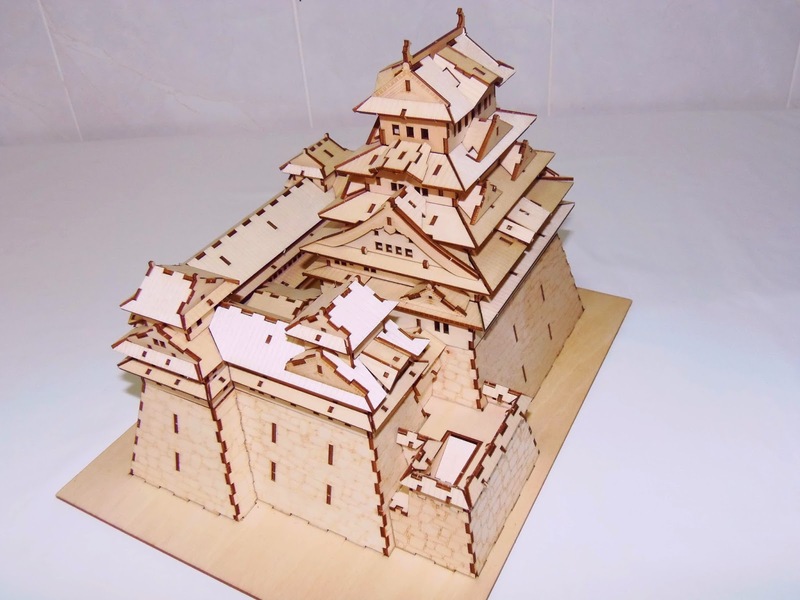 I have a pretty good collection of 3D models and I'm not a newbie on this kind of puzzles, but I've never built something as complex as the Himeji Castle model. 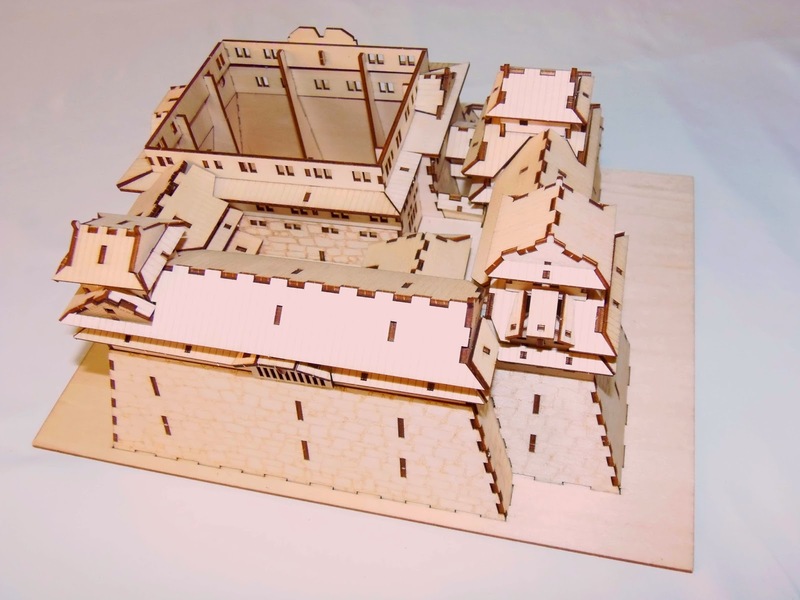 Usually, all the models I have took between 1 and 2 hours to complete, which is a far cry from the 6/7 hours of assembly time for the castle. Most pieces are close together (in number) in clusters and are easy to find, but there are a few that are scattered around in different panels. The reason was simply to save space on the panels and have an optimal usage of wood without wasting too much materials. 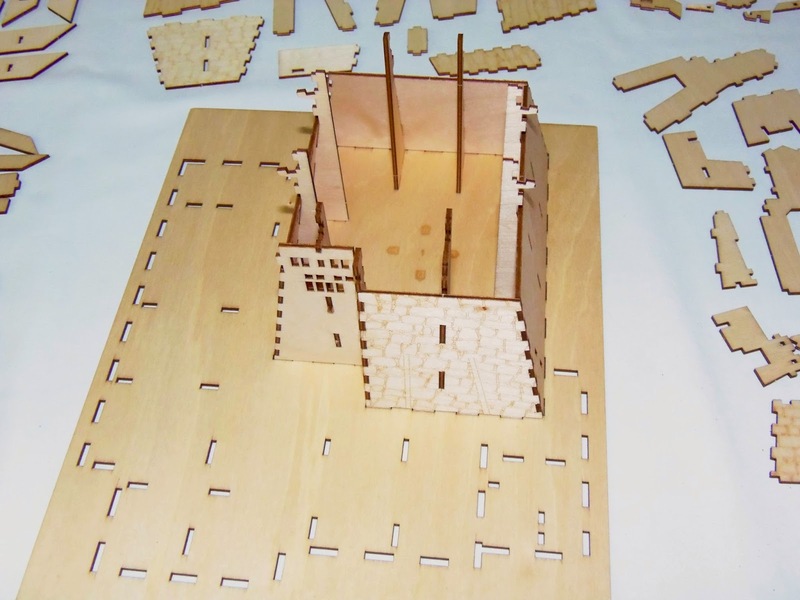 When you push the pieces out of the panels, it is best to keep them laid out in the same configuration as seen from the instructions, for convenience. Sometimes it did took me a while to find a specific piece, especially in the first part of assembly, when most pieces were still unused, but after a while it got easier and easier to find them. 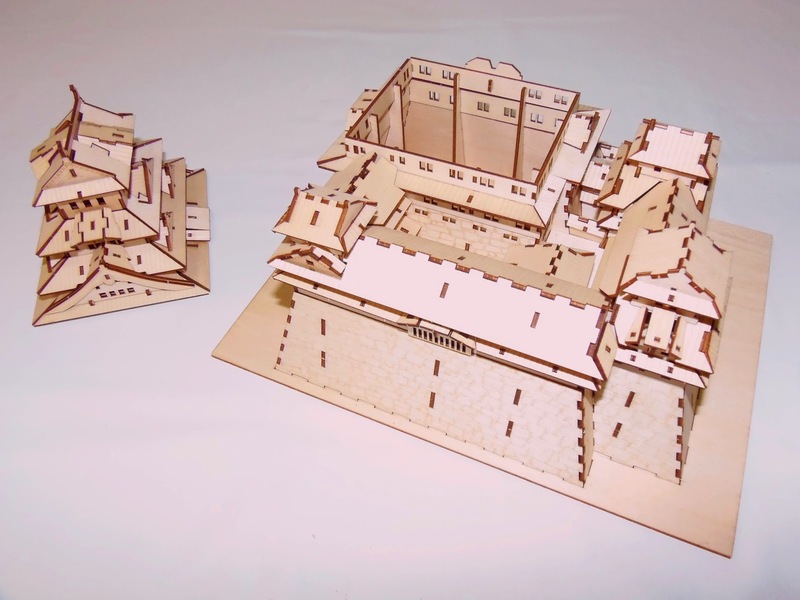 The assembly process is divided in two main parts: The first keeps you responsible for building the perimeter walls around the wooden panel and far side stories; the second part lets you build the higher stories, which will fit nicely with the rest of the model when all is finished. 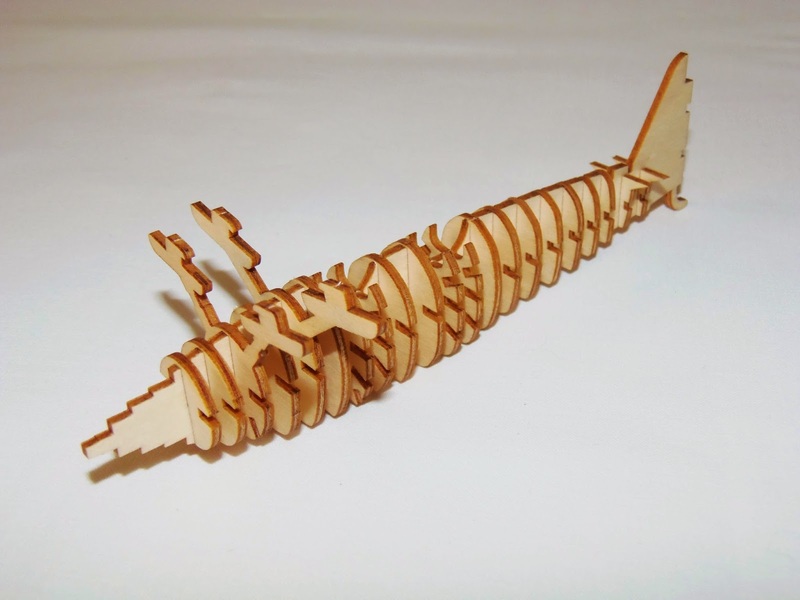 No glue is necessary for the assembly, but you can still use it in some parts, as in some cases the pieces may feel a bit loose, but won't actually fall off. A nice finishing touch that you might find interesting is to paint the completed model. 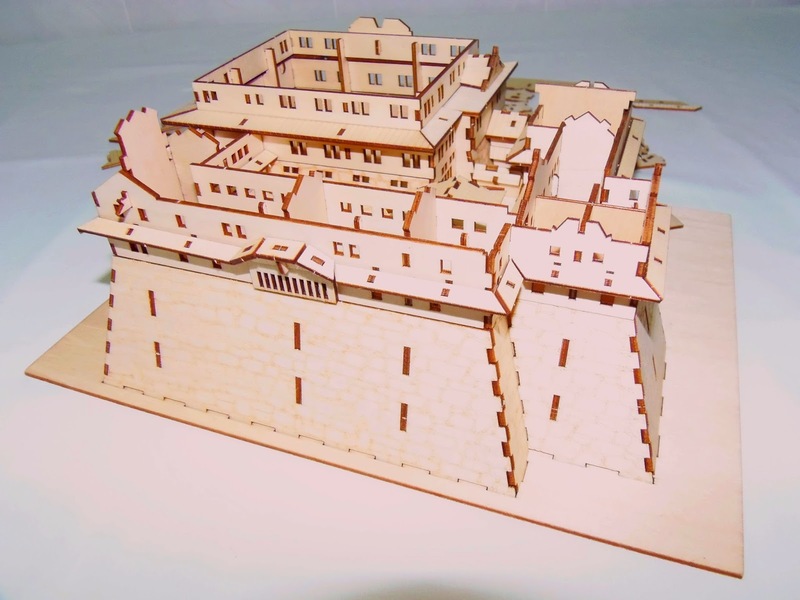 Painting before assembly would be impractical, though, since the paint could make the joints thicker or make the pieces swell, thus rendering it impossible to assemble. Since I don't have any painting skills, I better leave it with its natural look, which is rather nice, as well. 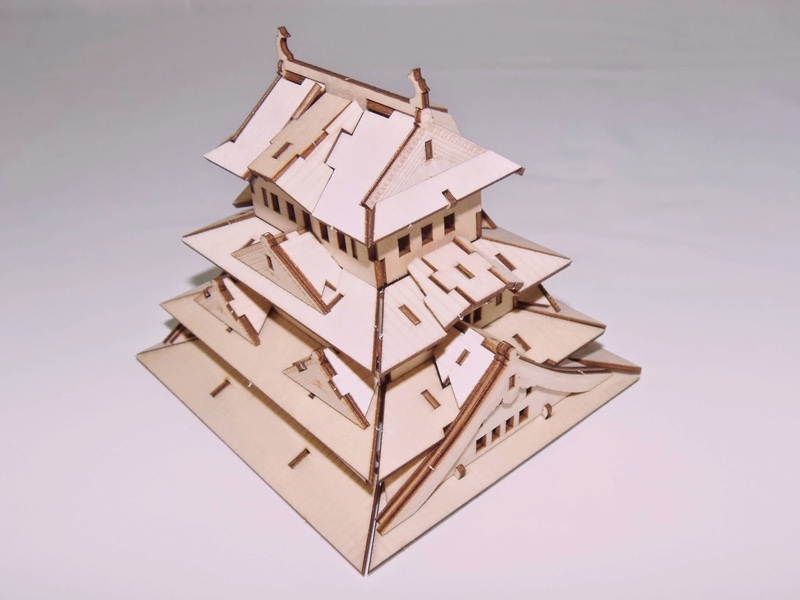 The two 3D models by Team Green were quite a joy to build. 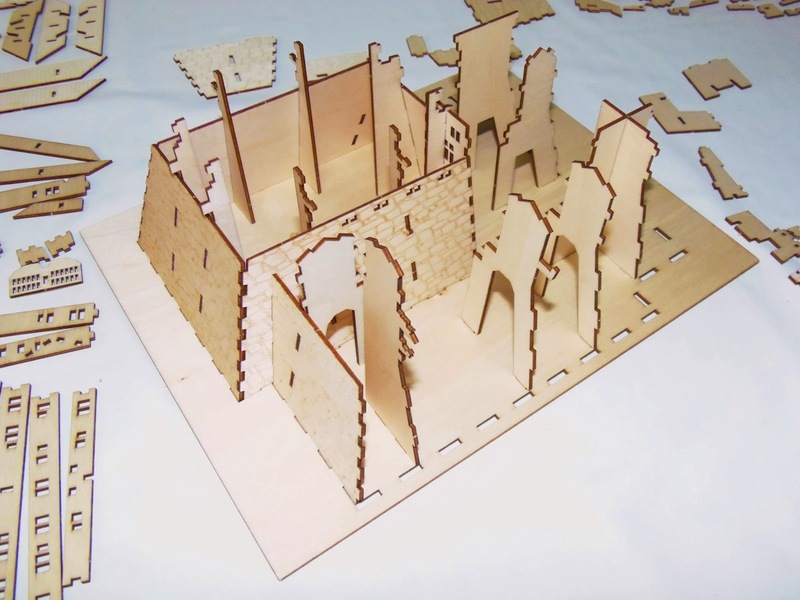 These puzzles are very fun and easy to do, even if you've never attempted to build 3D models before. While it took me a while to build them, especially the castle, I found the experience quite rewarding. To see the final model completed is indeed a great feeling, after so much time building it. Availability: You can explore the Green Team website at GreenTaNet.com, and find all kinds of models. With animals, buildings and other interesting objects, I'm sure you'll find something to like here. 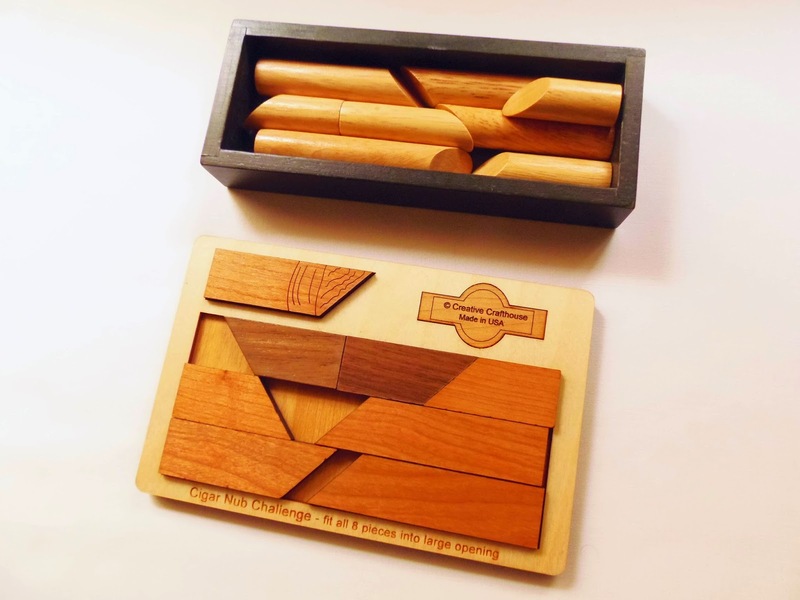 This is a really good looking puzzle from Creative Crafthouse, very well made and beautifully presented in a nice wooden tray. 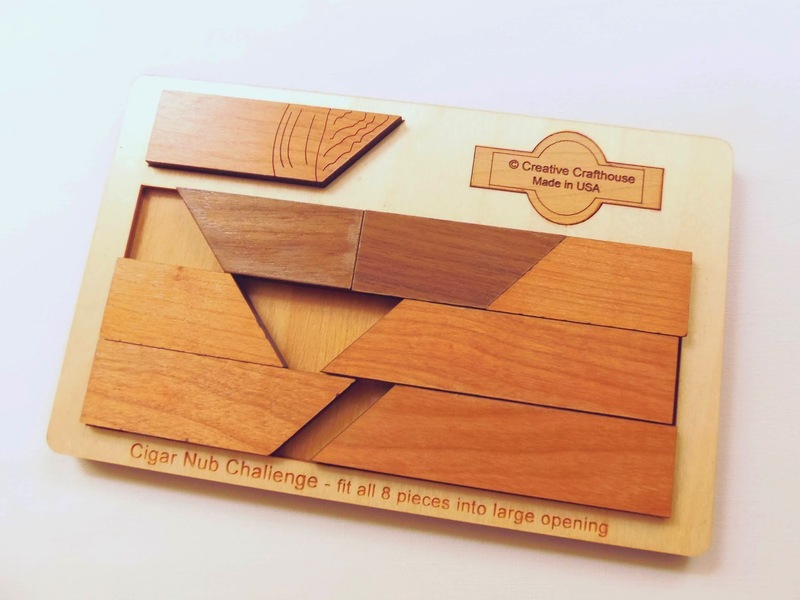 The Cigar Nub Challenge is a clean and safe puzzle for smokers and non-smokers alike, can be offered to a cigar lover or simply as a gift to yourself to enjoy a good and fun challenge. The Cigar puzzle is actually the same as the Lox in Box, but with a different theme. This was something I overlooked when I first saw this puzzle, as it looked like any other packing puzzle. The way it was presented was enough to pass it for another kind of puzzle. But since I'm a collector and I like puzzles, I didn't mind much after all ending up with two identical puzzles. They have different enough designs to still be worth a purchase. Below, you can see the two versions of the same puzzle. 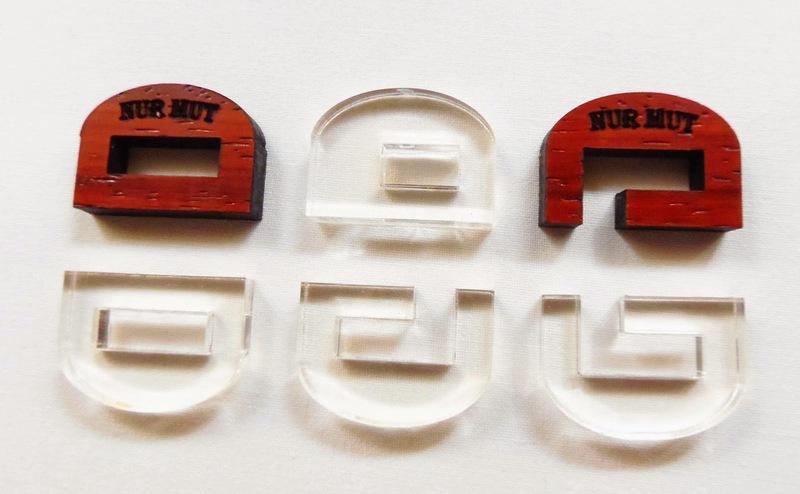 The goal of the Cigar Nub Challenge is to find a way to pack the extra wooden piece inside the rectangular frame, with the other seven pieces. The puzzle comes in its unsolved state, with the extra piece packed in its own slot. When solved, no empty spaces shall remain in the tray. 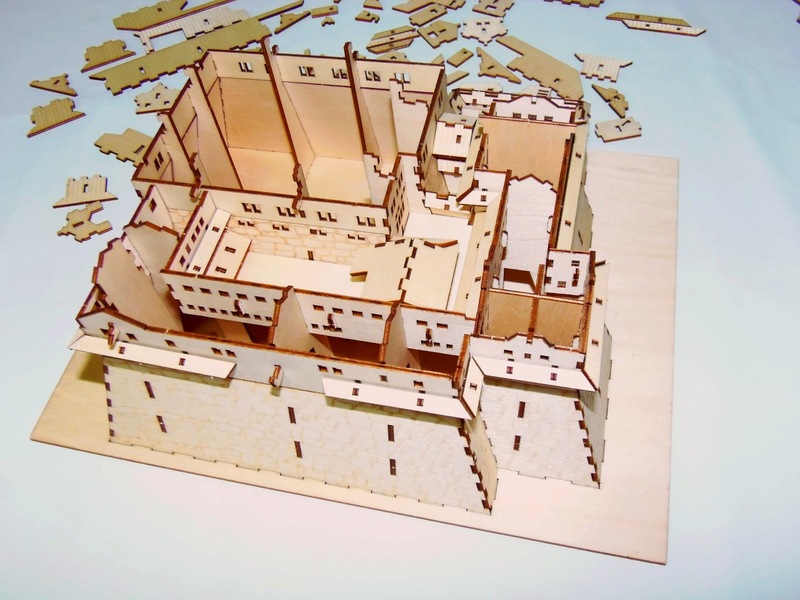 The puzzle is made from two types of wood, cherry for the light-colored pieces and walnut for the dark-toned pieces. 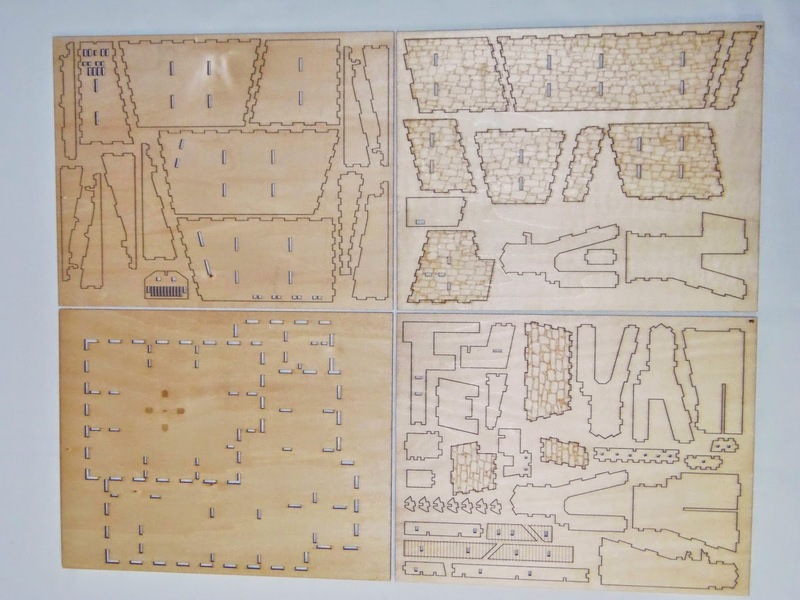 All the pieces are laser-cut to fit with precision in the frame, and the tray itself is made from plywood. The company logo is nicely placed in the corner of the tray, with the name of the puzzle engraved at the bottom. Since I already knew how to solve this puzzle - which I found out almost right away when I first attempted to solve it - it didn't offer much challenge. I also think the dark pieces give away too much of the solution. I understand that aesthetically it looks better with the contrasting colors, but it makes the puzzle too easy to figure out. The Cigar Nub Challenge is definitely not a difficulty level 8/10, as it's described in PuzzleMaster's website. Even though I knew the solution I think it's at best a 6/10, since most experienced puzzlers will quickly solve this one due to the color choices. But whoever rated it already knew the solution as well... Nevertheless, I think the puzzle is a great gift to a puzzle lover or as mentioned above, a cigar lover. 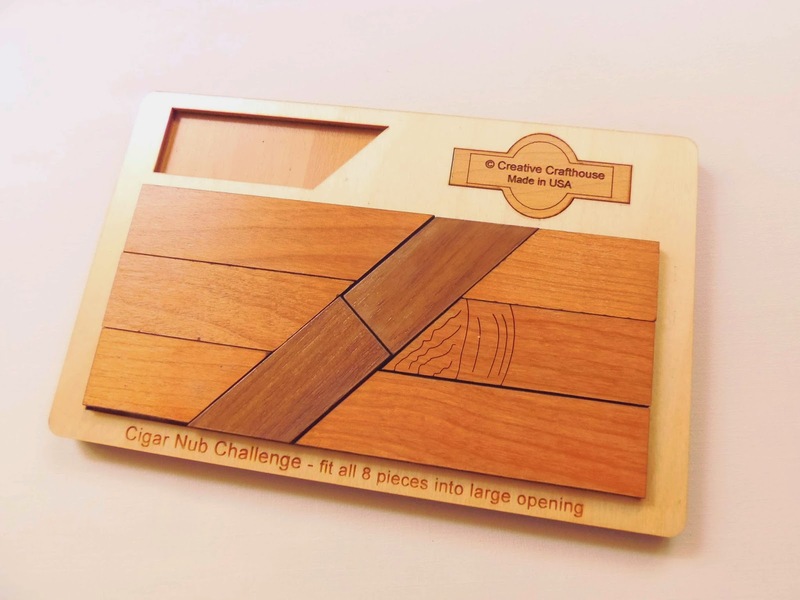 Availability: You can find the Cigar Nub Challenge at PuzzleMaster for $17.99 CAD. The see other puzzles by Creative Crafthouse, click here. Are you fascinated by all things Da Vinci? Do you like the feeling of searching for clues and decipher codes? Do you like to present your family and friends always with something unique and intriguing? Well, then the Puzzle Pod Cryptex might be the perfect choice for you. I've seen all kinds of puzzles that can store gifts inside: 3D Mazes, Puzzle Boxes, but this one is yet another interesting and fun way to surprise a loved one. The Puzzle Pod is essentially a custom puzzle. In other words, you make the puzzle for someone with a key word and give them clues in order to unlock the pod. It's that simple, but quite ingenious and original. You can use it pretty much for any kind of gift or to keep other things locked from others. It also functions as a coin bank. The mechanism of the pod is very simple to understand and resetting to any 5-letter word you want, but a step by step guide is included with the puzzle. When you set the pod to a new word, it unlocks by aligning all five rings in the direction below the arrow (raised marker) at the base of the pod. Here lies the essence of the puzzle. It's up to you to create all the clues necessary for the other person to discover the secret word. You can set up a whole game of adventure around it. There's no limit to what your imagination can come up with. Inside the pod, you can put any kind of object large enough to pass through the opening, which measures 7cm (2.76") and that isn't bigger than 19.7cm (7.76"). The pod is made from clear plastic, not actual glass. 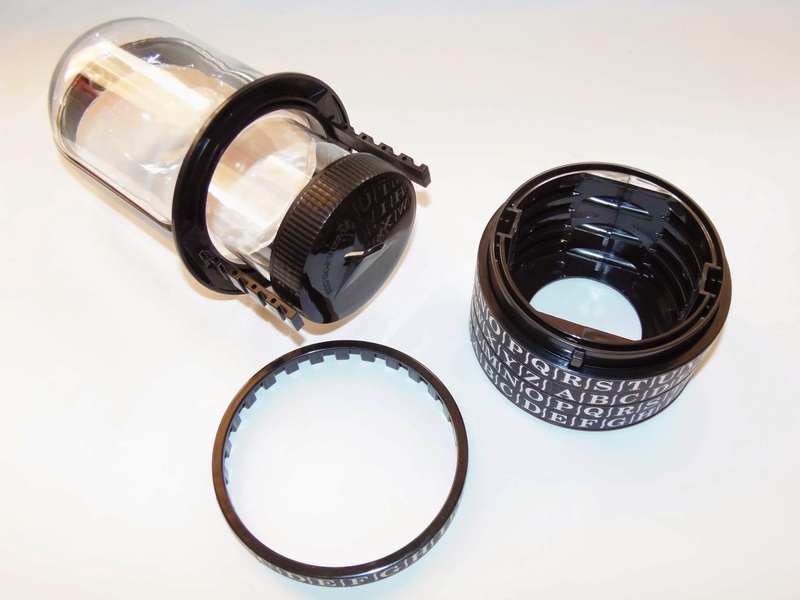 There is also another version of this puzzle for wine lovers, which locks a bottle of wine or liquor, although there are restrictions to the size of the bottle - most standard 750ml bottles will do. 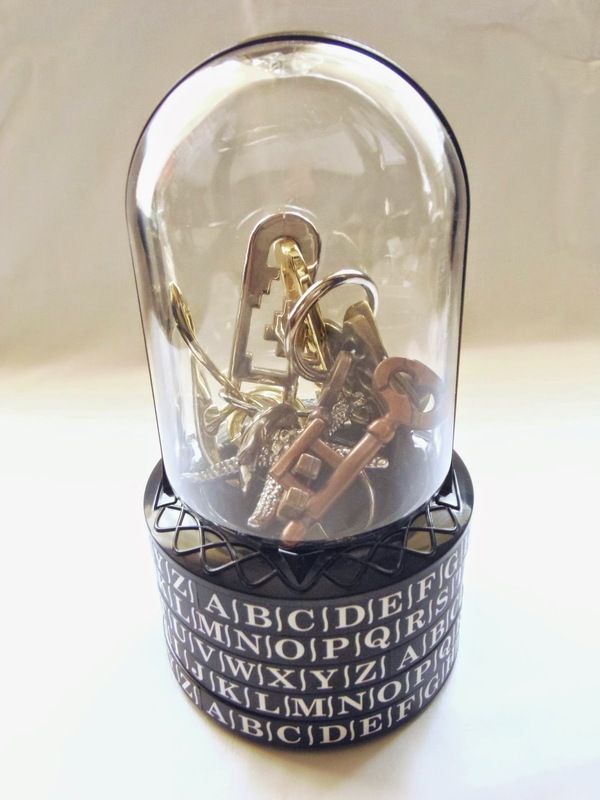 The Puzzle Pod Cryptex is a great way to get a gift to someone who has everything. It's an original way to get your friends and family involved and engaged in a fun activity, and make any special moment memorable. 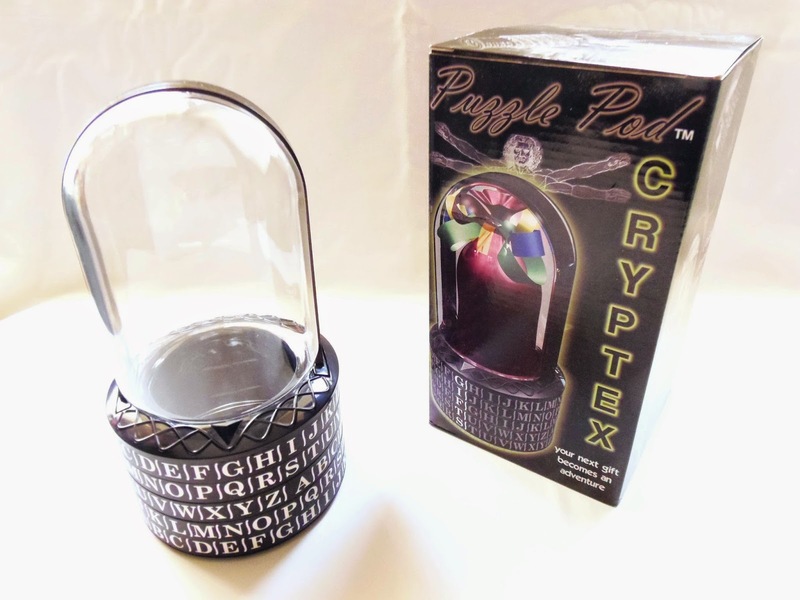 Availability: The Puzzle Pod Cryptex is available at Brilliant Puzzles for $29.95 USD. You can also get the Vino Vault here. The Cast Galaxy is yet another one to add to my favorite Hanayama puzzles...Along with the Cast News, Cast Harmony, Cast Radix, Cast Starfish, Cast Enigma...You get the idea...There are a lot of good ones, and to be among the best is saying something, as I'm very picky when it comes to choosing favorites. What surprised me first about the design of the Cast Galaxy was its actual size. From the pictures it looked a bit bigger, but when I first looked at it in person, I was a bit disappointed by its small size. I guess I was expecting it to be at least 10% bigger, since there are other bigger Cast Puzzles, and it would look fantastic just a tad bigger. Nevertheless, despite the size, the puzzle looks gorgeous. I love astronomy and anything space-related, so combining two of my favorite subjects is just amazing. The Cast Galaxy was designed by Bram Cohen, who also created the Cast Marble and Cast Rattle. 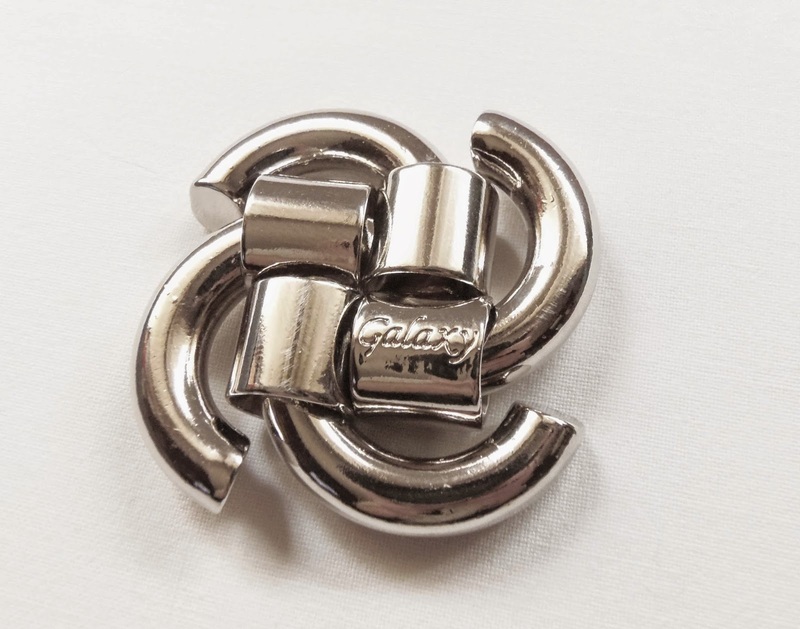 The theme for the Galaxy is "Knot". Are you prepared to untie this one? The Galaxy consists of two pairs of identical pieces, as each pair has its ends cut at different angles. Other than that, the pieces are pretty much the same. 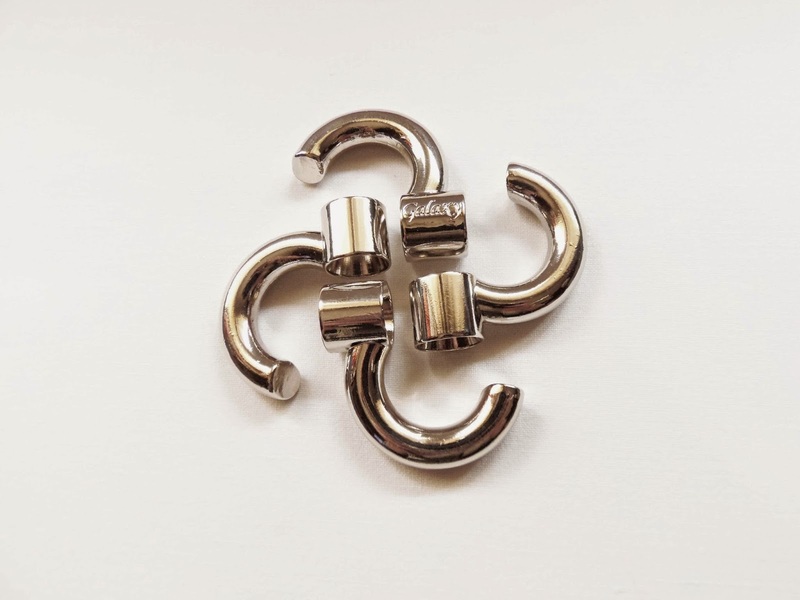 The pieces are shaped like hooks and in its initial state it forms a symmetrical shape in the form of a spiral galaxy, its arms extending outwards. The puzzle is coated with a silver finish, but I would've liked to see contrasting colors. Like any other Cast Puzzle, your task is to take the puzzle apart and put it back together. Rated as a level 3/6, this should probably be a walk in the park, no? Well, the first part of the puzzle - taking it apart - is not that difficulty, since the pieces move and slide quite easily. While it looks like it might come apart in a random fashion, or chaotic if you like, the solving process is actually something you have to do orderly and simultaneously with all four pieces. If you're familiar with the concept of coordinate-motion, then you'll know exactly what I'm talking about. The Cast Galaxy is not a difficult puzzle at all, but it challenges your motor skills like no other Cast Puzzle. The solution is not that complex like other Hamayama puzzles, but its symmetry and simplicity are rather beautiful, and for that, the Galaxy is now one of my favorites from the Cast family. Availability: To get a copy of the Cast Galaxy, or any other puzzle in the Cast Series, visit PuzzlesdeIngenio.com.